You have found the love of your life and now you want an engagement ring that represents the love you share. In Jasper, Indiana, Olinger Diamond Center helps couples find not just any engagement ring, but the ring that is the symbol of your match made in heaven. Olinger takes great pride in their personable service, which is why they have been Jasper’s trusted diamond source for 28 years. This week we are pleased to call Olinger Diamond Center of Jasper, IN our Coast Diamond Retailer of the Week. Passionate about diamonds, Kevin Olinger began providing couples the best service and prices in Jasper in 1990. Together, Olinger Diamond Center and Coast Diamond meet the high expectations of Jasper brides for an exquisite and timeless engagement ring. Coast creates classic and romantic engagement ring designs and Olinger helps you finish the design by guiding you through the diamond buying process. Owner Kevin Olinger holds degrees in geology, jewelry manufacturing arts, diamonds and diamond grading. David Welch is Olinger’s Jeweler of America Certified Master Bench Jeweler, of which there are only 300 in the country. Feeling confident in Olinger yet? We sure are. Look at these Coast Diamond rings Jasper brides are choosing. The elegant Coast Diamond one carat solitaire engagement ring (LS20000) has 0.66 tdw of round brilliant diamonds on the band. A match made in heaven for the Coast solitaire above, this Coast Diamond band (LS20015) boasts a half carat of round diamonds for brilliant sparkle. The Coast Diamond cushion shaped halo engagement ring (LC10420) sets off a beautiful one carat round diamond center stone chosen with the help of the experts at Olinger. Coast Diamond rings are completely customizable for any shape or size center stone and any metal type, making each ring as unique as the bride wearing it. The end result is an engagement ring that symbolizes your love as a match made in heaven. We can’t wait to see what you choose when you visit Olinger Diamond Center. Don’t forget to #ShowYourCoast on Facebook, Instagram or Twitter. We love to hear how Coast Diamond is part of your love story. Congratulations to Olinger Diamond Center of Jasper, IN for being our Coast Diamond Retailer of the Week! The halo engagement ring is a beautiful glittering symbol of your love. Over the past decade, halo engagement rings have become hugely popular. In the past few years, we have seen that the D. Geller & Son brides of the south choose a halo engagement ring, making it their own with a unique cut diamond center stone and distinctive details. These details tell us the story of their love and D. Geller & Son have a passion for helping couples tell their story. This is why we choose D. Geller & Son of Atlanta as our Coast Diamond Retailer of the Week. Each of the Coast Diamond Collections features distinct halo designs. Coast Collections (Charisma, Romance, Allure, Vintage, Rose Gold, Wedding Band) reach across a broad range of lifestyles. Which one tells your love story? Year after year the oval-shaped diamond is a favorite of D. Keller brides. The Coast Diamond oval halo engagement ring (LC5410-OV) is crowned with a halo of diamonds. For more sparkle, this delicate halo ring has 0.20ctw diamonds on the band. Do you have an heirloom diamond that you want to put into your engagement ring? This Coast Diamond halo engagement ring (LC10146) is made for the one-carat diamond center stone of your choice. The braided diamond band and cushion shaped halo are decorated with 0.30ctw diamonds. For some, extraordinary isn’t so out of the ordinary. This seems to be the truth for Ganem Jewelers in Arizona. We have featured Ganem Jewelers as Coast Diamond’s Retailer of the Week three times because of how extraordinary their customer service and selection are for their customers. But there is, even more, to tell you about, which is why Ganem Jewelers of Arizona is our Coast Diamond Retailer of the Week once again. Wheels and Watches, Ahwatukee is a fun event where you can show off your car while shopping Ganem’s extensive inventory of pre-owned watches. Enjoy a little lunch too. And there is Ganem Jewelers’ Annual Estate Sale where you can shop gorgeous pieces of pre-owned fine jewelry. Follow them on Facebook to keep up on their many events throughout the year. Created for a 1.5-carat diamond center stone, this glamorous Coast Diamond halo engagement ring (LZ5016) boasts over one carat of round diamonds on the band and halo of the ring. This stunning Coast Diamond solitaire engagement ring (LZ5001H) is extraordinary with its graduated round diamonds that rise up to meet the 1.5-carat center diamond. For a bit of extra sparkle, there is a peek-a-boo diamond in the gallery of the ring. When you want to show off a two-carat diamond center stone this Coast Diamond solitaire engagement ring (LC10020) is it. The intricately set diamonds on the side are the perfect amount of extra sparkle. Ganem Jewelers goes above and beyond to provide a variety of services for those who prefer the extraordinary things in life. Ganem Jewelers’ The Vault, in Tempe, AZ, is where you can securely store your finest things. The Jewelry Buyers in Tempe, AZ is dedicated to turning your diamonds, jewelry, watches, and valuables into cash on the spot for you. Congratulations to Ganem Jewelers of Arizona for being everything extraordinary and our Coast Diamond Retailer of the Week for the 4th time! To see these and more Coast Diamond rings near you visit an Authorized Coast Diamond Dealer in your area. No Matter the Occasion, Especially Jewelry of Lee’s Summit, MO Would Love to Help you Find That Special Gift of Coast Diamond. Care – Professionalism – Selection – Keen sense of style – These are the things you look for when you buy the special gift of diamonds. Especially Jewelry is a place like that. They have a staff that cares deeply about the needs of the customers. Their professionalism shows in their desire to educate you in your purchase and continue providing you exceptional service for years to come. Their selection of fine jewelry and diamonds reflects their keen sense of style. No matter the occasion for the special gift of Coast Diamond, our Retailer of the Week, Especially Jewelry of Lee’s Summit, MO would love to help! The team at Especially Jewelry of Lee’s Summit, MO (from left to right Jon Romero, Joyce Langston, Robin Cook, Julie Cook, Del Cook) would love to help you with that special gift of Coast Diamond! What is your special occasion? One of our most popular Coast Diamond halo engagement rings, the cushion shaped halo engagement ring (LC5257-100) with a one carat round diamond center stone is a stunner. The diamonds cascading down the band of the ring make quite an impact. This ring is also available with a 0.5 carat round diamond center stone (LC5257-050). The delicate Coast Diamond oval halo engagement ring (LC10233) has intricately set diamonds in the band. The one-carat oval diamond center stone elongates the finger. If the oval center stone is your favorite shape, Coast has a wonderful selection of rings (and even a gorgeous paraiba necklace) to choose from. Coast Diamond bands are the perfect gift for an anniversary or any special occasion. This Coast Diamond band (WC5106) with three rows of fishtail set diamonds makes a fabulous anniversary gift. This special gift of diamonds is sure to show her she is the love of your life forever. 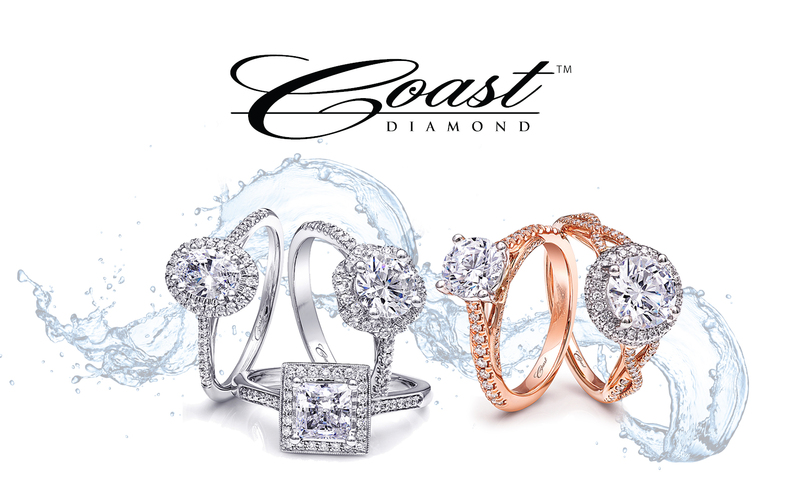 For our complete collection of Coast Diamond bands click HERE. Click here to contact Especially Jewelry. Congratulations to Especially Jewelry of Lee’s Summit, MO for being our Coast Diamond Retailer of the Week!